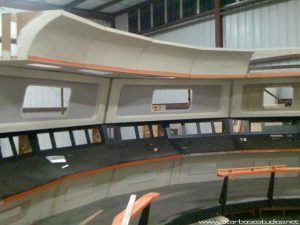 If you read my recent blog about Starship Exeter’s second episode, you’ll recall that when we last left the magnificent Exeter bridge set, it was rotting, unused and forgotten, in a barn in central Texas. What happened next is the amazing and heartwarming story of Starbase Studios. Back in 2010, a fellow named John Hughes from Oklahoma City wanted to start up a new fan production called Starship Ajax. John knew that having a fully-crafted TOS bridge to film on would be a huge head start for his project, and so he decided to track down the “forgotten” Exeter set… and he found it in Austin, TX. The bridge pieces had actually been stored in a number of different places, but a good portion were sitting in a barn, exposed to the elements, and in pretty sad shape. The owner of the set, Exeter producer Jimm Johnson, despite the thousands (possibly tens of thousands) of dollars and countless man hours that went into building that once-proud bridge replica, decided to donate all the set pieces to John and Starship Ajax for free. 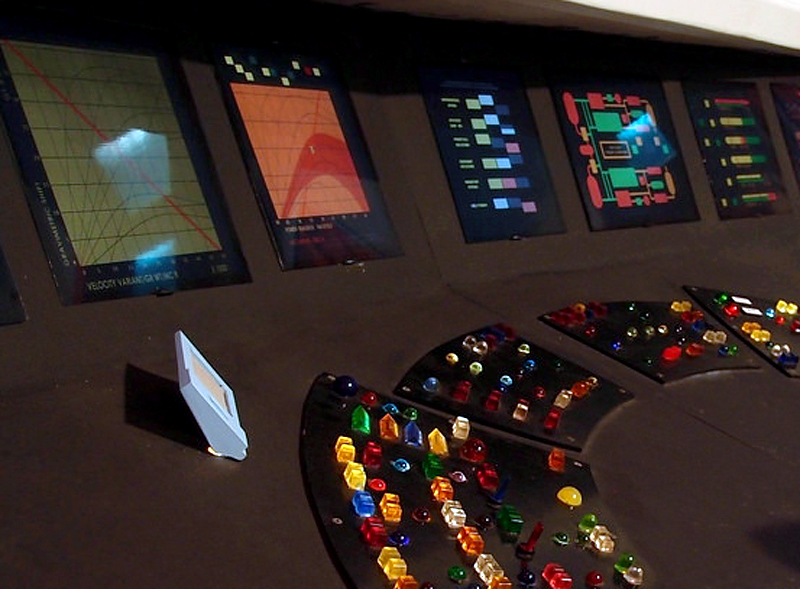 The once-proud Starship Exeter bridge set, damaged by the elements. Once back in Oklahoma, John was joined by Alec Peters (who would later become executive producer of Prelude to Axanar), John Kelly (real name Muenchrath, who played Dr. McCoy on Star Trek: New Voyages/Phase 2), and Vic Mignogna (who would later set up and star in Star Trek Continues). Each was hoping to help work to restore the bridge and use it to film their own future fan projects, adding other TOS sets, as well, like sickbay and a briefing room. Ads went out on Craigslist looking for volunteers to help rebuild the bridge… nearly from scratch because of all the damage. Unfortunately, a number of factors led to the rent payments on the hangar being missed, and they lost their lease. Alec Peters and John Kelly parted ways with Vic Mignogna, who left to work at Starship Farragut’s studios in Georgia. John Kelly moved on, as well, and Alec Peter eventually headed west to form Ares Studios. This left John Hughes on his own. Well, not quite on his own. Two of the people who volunteered to help restore the bridge were Richard Wells and Scott Johnson. After the bridge was moved out of the hangar, John Hughes split off the production of Starship Ajax from the bridge restoration project so he could concentrate more on his fan film. 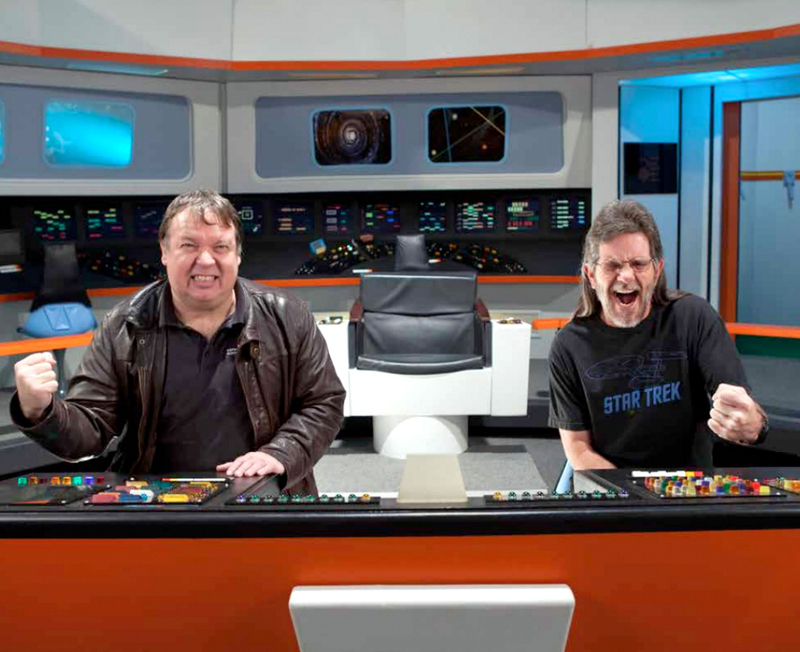 This left Richard and Scott in charge of rebuilding the set and creating Starbase Studios, turning it into an open resource for any fan looking to film on an authentic-looking TOS bridge set… for free! In doing so, they have managed to create one of the most unique fan film resources to ever hit the world of Star Trek. So this time, instead of talking about just a single fan film, we’re going to take a look at Starbase Studios, which has been utilized multiple times by a dozen different independent film productions. Richard Wells (left) and Scott Johnson of Starbase Studios (photo by Nathan Poppe, courtesy of This Land Press). JONATHAN LANE: So you both answered a Craigslist ad to work on this project. I assume that means you’re both pretty big fans? RICHARD WELLS: I’ve always liked Star Trek. 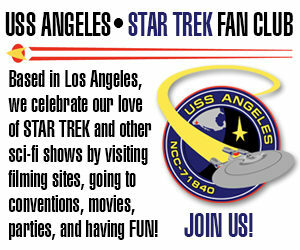 I’m a Star Trek fan, but I’m not a Trekkie… something I’ve really found out since I’ve been involved in this! At the time I signed up, I wasn’t working full-time, and I had a lot of time to kill. I did that for a few weeks, and I told Scott what I was doing. I knew he liked Star Trek, but I didn’t realize at the time that he was a big Trekkie. SCOTT JOHNSON: I grew up watching the original series when it first aired. Now granted, I was two or three in the playpen when it was on in ’66, but I remember bits and pieces of watching it “though the bars on the jailhouse” as I called it when I was just a little kid with my mother. I’ve always been an addicted fan to the original. I knew Richard through work, and we both come from the concert industry. He called me about five years ago one afternoon and said, “Hey, aren’t you a Star Trek guy?” I said, “Yeah, I like the original stuff.” So he came and picked me up, and drove out to El Reno, Oklahoma where the thing used to be housed at, and I walked in the door and saw the half-bridge that they inherited from Exeter, and my mouth hit the floor, tongue hanging out. I signed on that day, and I’ve been working with these guys ever since! JONATHAN: So the sets were initially moved to an airport hangar in El Reno, but then the rent didn’t get paid. What happened next? JONATHAN: Seriously? It was that easy??? RICHARD: The building owner likes Star Trek, and he thinks it’s cool that we’re here. He lets us use half of his warehouse in exchange for us doing maintenance on the building, keeping the grass mowed, and stuff like that. RICHARD: If we were having to pay rent, there’s no way we’d survive. From the outside, you would never suspect this unassuming building in Oklahoma City houses an intricate Star Trek TOS bridge set! JONATHAN: Yeah, I was wondering about how much this was costing you. I looked you up on Google Street View, and the warehouse looks fairly, um, unassuming might be the kindest word. But at least it’s free… and it’s pretty close to the center of Oklahoma City, right? RICHARD: We’re five miles from the center, four or five miles from the airport, and just a couple of miles down the road are all of the normal businesses that you would have around an airport. Immediately surrounding us in the warehouse are all the restaurants, hardware stores, and anything else we need. It’s really a nice location…we don’t have to go very far to get anything. JONATHAN: When you first got the bridge, it wasn’t a full 360-degree set, was it? RICHARD: No, I don’t believe Exeter ever had a 360-degree bridge. We got the pieces from the communications station to just before the viewscreen. We built the rest of it ourselves, including the viewscreen and turbolift. RICHARD: From scratch, but at least we had the Exeter stuff to look at. And even the Exeter stuff had to be refurbished. Most of the wood covering had been wet. SCOTT: Remember that when John Hughes and his team inherited this, the thing had been stored outside in a pole barn for a number of years. So pardon my French, it was beat to smithereens! The existing stuff was mostly refurbished by the time Richard and I got involved. But when we had to build the other side, we had nothing to go on. No plans. No nothing. “How big should we cut this?” “Well, measure the other side!” It was quite interesting putting the thing together. Finally, a full 360-degree bridge set! Photo by Bubba Brand. JONATHAN: Was anyone an actual carpenter? SCOTT: I come from the concert business. I’ve got 25 years as a lighting designer. I know the business end of a hammer, and I can use a tape measure. But other than that, I’m not a carpenter. Fortunately, I’ve got a couple of friends of mine who are house-builders here in Oklahoma City. So when I run into problems or Richard has questions, we just go hook up with one of our builder guys and ask what they recommend. JONATHAN: So they don’t volunteer, but they give you free advice? JONATHAN: And how many volunteers have you had working on restoring the bridge? RICHARD: Oh, I’d say at least a couple of hundred. A lot of people put in a lot of time. JONATHAN: Wow! And what kind of work did they do? Each of the 57 console displays runs a separate 2D animation on an LCD monitor hooked up to one of 16 computers. JONATHAN: Ah, yes, the computers! According to my online research, it says you’ve got 16 computers running 57 LCD monitors on your bridge. Is that right? RICHARD: Yes, I think that’s about right. JONATHAN: Computers are not cheap. They’re certainly not as cheap as lumber and paint! How did you afford 16 computers and 57 LCD monitors? JONATHAN: Oh, I was going to ask if they just fell off the back of a truck. RICHARD: Well, computers are pretty cheap on public surplus when you buy ’em by the palette load. 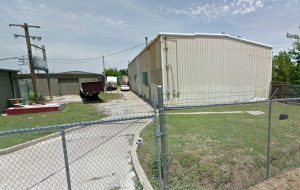 I hit public surplus auctions and would buy a palette of computers and monitors here and there, wherever I could find them. And once things got going and everyone saw how it was turning out, then we started having people donating computers and monitors to this project. It didn’t take as long as we expected to get everything all wired up and going, and now it looks pretty good! RICHARD: I should add that all those awesome graphics animations came from TOSgraphics.com and were carefully recreated by Will Smith (not the famous actor, another guy with that name). He spent years watching clips from the original series to recreate those graphics, and they are as close to the original as can be. JONATHAN: I read that you cut a special mold to make custom-sized marbles for the round buttons and used an ice tray to make the square buttons. That sounds pretty resourceful! Buttons, buttons! Everywhere you look, there’s buttons! RICHARD: Seeing as how none of us has ever done anything like this before, it’s all trial and error. I never knew so much about ice cube trays and marbles before I started this! The five-eighths-inch marbles that they used on the panels… they don’t make those sized marbles anymore. And I bought eight or nine different ice cube trays looking for the one that would look closest to the original buttons. And I read somewhere since then that they actually used that same kind of ice tray in the original show to make their square buttons. I’m not sure if that’s true or not, though. And we used the same resin for the marbles and the buttons. How deep the color is depends on how much dye you add. JONATHAN: From the time you first moved the sets from Texas, how long did it take you to fully restore the bridge from its dilapidated condition? RICHARD: I’ll have to let you know when we’re done! JONATHAN: So you’re still working on it? RICHARD: We’ve got the biggest part of it done. There’s still a lot of little things that need to be done. But I think it took us four years to get it to the point where we could film, and now we’re going on six and a half years of actually having it. JONATHAN: What’s still left to do? I look at your bridge, and it looks pretty darn good! Next time: we conclude our interview with Richard and Scott and find out how the bridge survived not only one but TWO of the most severe storms to hit central Oklahoma in twenty years! We’ll also learn which fan series have already filmed at Starbase Studios and how you, too, can live out your fantasy (same as mine!) 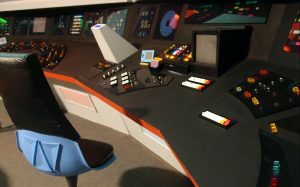 of sitting in the captain’s chair on the bridge of the USS Enterprise. 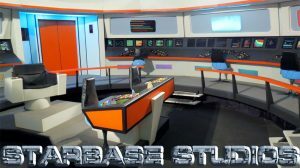 In the meantime, feel free to check out the Starbase Studios website. Previous Previous post: PROJECT: POTEMKIN releases its latest episode! Next Next post: STAR TREK: RENEGADES announces its series finale!